So many pieces of cloth and patches of leather lying around - time to make a beautiful quilt out of them! This requires significant effort and time though and a steady supply of buttons. The player who picks the best patches and combines them most skilfully into a patchwork quilt wins the game. Patchwork is a real gem. 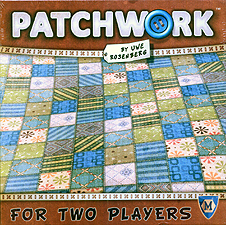 For less than £20 you really are getting a very competitive 2 player game that is not just about winning but creating the best patchwork quilt you can. The object of the game is to purchase shapes based on the amount of money (buttons) you have. Think Tetris in that you then use the shapes purchased to fit them on the board without leaving too many gaps. Every gap you leave equals 2 points deducted off your final 'button' total. Because of this it is not unusual to see negative scores! The game comes with three boards, two boards to build your quilt on (from the Tetris style patchwork pieces) and one that keeps track of time. That's because every patchwork piece costs buttons, but also time. There is a real decision to be made from getting that piece you need and not moving too far down the time track, because the player in last place always goes next. Meaning you can easily get multiple turns. Sometimes you will want to move ahead though as on the time board there are five single piece patches that can help fill in gaps. Some of the patches have buttons printed on them and if you use these in your quilt you will earn buttons equal to the amount on your sheet every time you pass a button on the time track, or if you elect to move past the other player instead of buying a patch. This is a well thought out, quick and surprisingly deep two player game. I would have no issue in recommending this to anyone. Bought this recently for my wife's birthday and it has proven to be instantly one of our favourite games. It's a dedicated 2 player game from acclaimed designer Uwe Rosenberg and is not complex to learn but gives a good amount of strategy for the play time. This game brings in resource management (time and buttons) along with puzzle aspects. All fairly abstract but tremendous fun! Patches are arranged in a circle and players will get the chance to buy one of the three pieces nearest to the main pawn which acts as a marker. The pieces will be demarcated with 3 different pieces of information: 1 - the shape (players are trying to fill in their boards which are a grid of squares, tetris style. 2 - the cost in buttons (players have the unusual currency of buttons) 3 - the cost in time. There is a central board and players have a marker which makes its way around a spiral track. The more time intensive pieces they buy, the quicker they will progress to the finish. Along the spiral track in the centre there are various bonuses single square patches which can be picked up by the first player, so there is a trade off to being first to pass these markers. They can prove useful in filling in odd squares on your board. Also along the track there are button markers which when passed mean that the player will receive their income in buttons, which will be equal to the amount of buttons on their patchwork. Victory condition is the player with the most points. Points are calculated in buttons you have left at the end. Any uncovered squares in your grid will result in minus 2 points. This games is great fun and can be very tight, with lots of really good decision making.